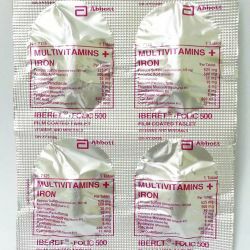 For the prevention and treatment of iron, B complex and folic acid deficiencies due to poor diet, illness, or pregnancy. As nutritional supplement before, during, and after pregnancy. Ferrous sulfate (equivalent to elemental Iron 105 mg) 525 mg, Calcium pantothenate 10 mg, Folic acid 800 mcg, Vit. B3 30 mg, Vit. B1 6 mg, Vit. B2 6 mg, Vit. B6 5 mg, Vit. B12 25 mcg, Vit. C 500 mg. Adults: Take 1 tablet daily with or without food, or as prescribed by the doctor. Caution use in patients with pernicious anemia or problems with the kidney, liver and intestines. Avoid alcohol intake. Ask for doctor's supervision or advice before use during pregnancy and lactation. Constipation, diarrhea, or stomach discomforts; Stools may become darker in color; Rarely, allergic reactions. This product should NOT be given to children or pediatric patients.